When I first started performing this effect I did it with the four aces, I've long since abandoned that idea. The effect is so amazing that using aces will only convince the audience that there is something "special" about the aces. 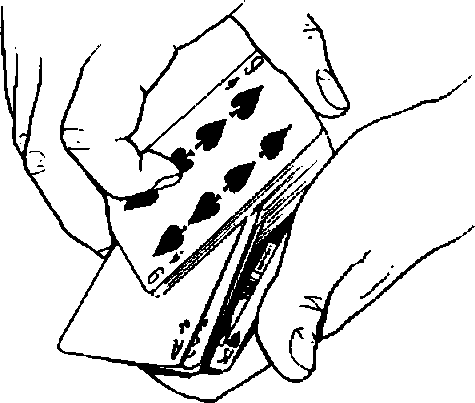 Letting the audience decide which four of a kind to use is the only way to make them realize that the secret lies, not in the cards, but in your hands. If you ever have occasion to have a session with a card cheat I suggest you perform this item. In my experi' ence, they find it incomprehensible (as do lay audiences). *5> In. the thirty years i've been performing this effect. I've experimented with many different ways of presenting it. If you're surprised that it took me three decades to arrive at the simple and straightforward presentation outlined above, I can only say that sometimes that's the way it goes. By far the most challenging aspect was finding a way of handling the final revelation that would produce the strongest impact. I think it's worth explaining why 1 have found the approach explained above the strongest. First let me say that I think the worst possible way to handle the climax is to perform four separate fancy revelations to produce the cards. There are two reasons for this. Firsdy, it puts the emphasis on the wrong element. The revelations will actually distract from the strength oi this effect, which is the utterly impossible conditions under which you succeed in controlling the cards. Fancy revelations can be impressive, but you shouldn't waste a powerful control on a trick about fancy revelations. A quick multiple shift would be good enough since the revelations are all they'll remember anyway. This trick is about the control, not about the production of the controlled cards. Secondly, separate revelations lead the audience to think that you're producing the cards from different parts of the deck. In many situations this is a good thing. In this trick, however, the amazing thing to an audience is that four cards that were indisputably scattered throughout the deck could end up together alter just a couple of shuffles. To produce them in a way that suggests that they remain scattered throughout the deck betrays the effect's strength. Save the fancy revelations for tricks that have nothing else going for them. A better approach is simply to deal the four cards off the top of the deck. I used that ending for years. I found one problem with it, however. Controlling even one of the four cards to the top under such impossible conditions is astonishing to laypeople. It's so astonishing that some people would look away in amazement, or even close their eyes, immediately upon seeing me deal the first card. This meant that they missed the revelation of the next three cards. After a lot of experimentation I found the perfect solution in the handling I described above. It sets up the audience to expect that you've cut to one card» making the revelation of the other three a complete surprise. Yet. it reveals all four cards at once, ensuring that no one will miss part of the climax by reacting too early. And it keeps the emphasis on the trick's most astonishing feature, that you could so effortlessly control to the top four cards that were hopelessly lost in four separate parts of the deck.